Channel below the Pan Chukki water works, [Aurangabad]. bl.uk > Online Gallery Home	> Online exhibitions	> Asia, Pacific and Africa Collections	> Channel below the Pan Chukki water works, [Aurangabad]. 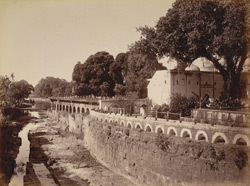 Photograph of the channel below the Pan Chakki water works at Aurangabad, photographed by Deen Dayal in the 1880s. This is from the Curzon Collection: 'Views of HH the Nizam's Dominions, Hyderabad, Deccan, 1892'. The mill was constructed in 1695; an oblong reservoir was added by Jamil Beg Khan in about 1715. The mill was an impressive engineering feat. Water was pumped from a reservoir in the hills about six kilometres away then channelled into a tank. This water was then used to drive a grindstone to mill flour for the madrasa, or theological college, nearby. Underneath the tank was a large assembly hall supported by four rows of robust pillars.